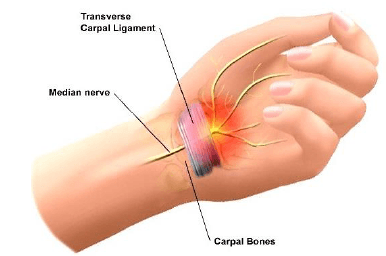 Right over the wrist of the hand lies the transverse carpal ligament, which compares to a bracelet which makes its way around the wrist. 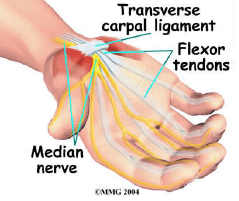 The carpal tunnel is the narrow space located between the transverse ligament and the wrist bones. 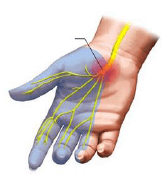 Inside the carpal tunnel run a variety of structures, including the median nerve (see image on the right). 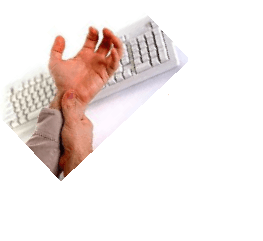 Carpal tunnel syndrome is characterized by a narrowing of the carpal tunnel, causing a compression of the median nerve. Physiotherapy treatments will usually be carried out in addition to the medical treatments provided by your physician which, depending on the case, may consist of an anti-inflammatory prescription, an immobilization of the wrist in a splint, or even surgery. In physiotherapy, treatments will aim to reduce the compression at the carpal tunnel and to reduce the pain and inflammation. This will be done with the use of electrotherapy modalities (such as ultrasound or TENS), contrast baths, ice and proper education regarding the activities that may worsen your condition and thus that should be avoided for the time being. Then, your therapist will use a wide array of manual therapy and myofascial release techniques, and will prescribe effective stretching and muscle strengthening exercises specific to the wrist. Therefore, please consult a Forcemedic physiotherapist as soon as possible for a quick recovery!